Adorable My Sweet Fiend Skulli (Huggably cute; nightmarishly lethal!) 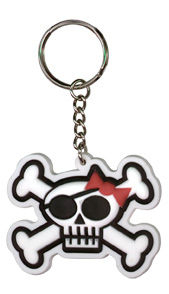 with an eyepatch and crossbones....and, of course, her trademark pink bow. 2.125" x 1.75" rubber keychain. Artist: Cruise Ship Drummer!